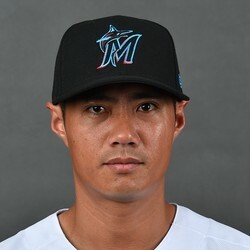 Wei-Yin Chen allowed five runs on seven hits with two walks and four strikeouts over four innings against the Phillies on Friday. It was the second loss in a row for Chen and also the second straight outing in which he's only lasted four runs. He was showing signs of being useful for fantasy purposes, but that stretch has ended as he's now allowed eight runs in his last eight innings. Wei-Yin Chen only made it through four innings on Saturday, allowing three runs on five hits and two walks. He did strike out six, but wasn't close to a quality start. The Marlins ultimately lost 5-1, dropping Chen's record to 6-10. He'll take a 4.72 ERA into his next start, where he won't be a recommended fantasy option. Wei-Yin Chen allowed one run on three hits over eight innings against the Blue Jays on Saturday. He struck out seven and earned the win, moving to 6-9. Chen has been dominant the last two starts, allowing just one run over 14 innings. He's a completely different pitcher at home (1.86 ERA) vs. the road (9.35), and considering his next start is in Pittsburgh, fantasy owners should avoid him. Wei-Yin Chen held the Braves scoreless over six innings with six hits and two walks to go with 10 strikeouts on Saturday. Chen has now turned in four solid starts in a row, missing out on four straight quality starts by just a few thirds of an inning. He remains hard to trust overall and his upside is limited by several factors, but he could be a streaming option down the stretch in deeper leagues considering his recent form.